What happens when user experience pros come to your lab? 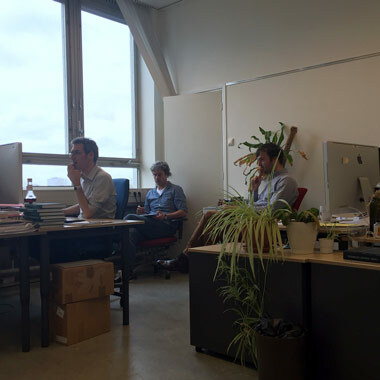 At Elsevier, we work with a large number of researchers daily. We also integrate researchers into our prototyping and development projects through regular interviews, ethnography and beta testing. Onsite interactions are done primarily by our user understanding researchers. 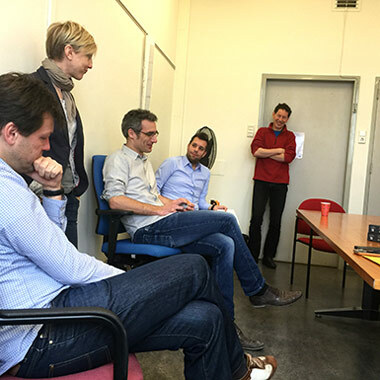 To get even better insight into how researchers work, one of our prototyping teams recently spent the day with Prof. Frank van Harmelen’s 15-person Knowledge Representation & Reasoning group at the VU University Amsterdam. The entire team participated, including designers, product managers and developers. 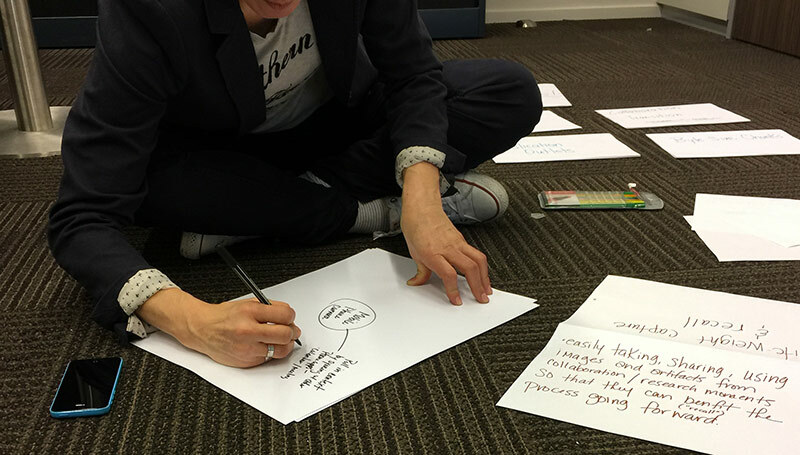 Heather Williams, Senior User Experience Researcher and Designer, led a structured innovation process aimed at eliciting the work challenges faced by these researchers, especially when it comes to interdisciplinary collaboration – something that Prof. van Harmelen actively promotes. 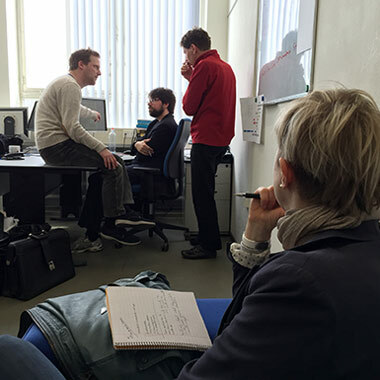 The process starts when user experience specialists observe researchers at work. After the leader collects these observations, the next step is to tease out why particular actions occurred. For example, the observers noted that several researchers were switching among multiple sharing environments (e.g., GitHub, Dropbox, Google Docs and email), so they asked what their motivation was for task switching. Likewise, they observed that one researcher was keeping references in a plain text file and only later moving them to Mendeley. The session involved getting to know the group, two phases of in-person shadowing, a joint lunch, and a structured analysis of the observations performed. The resulting observations led to over 65 insights about the work habits, challenges and daily activities of this group of researchers. These insights stemmed from not only how the researchers worked but also their environment. 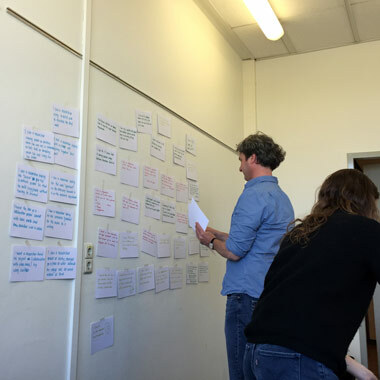 For example, a whiteboard was being used to record a to-do list, and a postdoc made a quick decision about who would speak at an interdisciplinary conference after walking down the hall and talking with his colleagues. The use of the whiteboard means that information often is place-specific and not captured digitally, hampering collaboration with collaborators who are not physically present. Physical presence was also crucial in making rapid decisions. These clues were boiled down to eight themes. A sample theme is supporting light-weight capture and recall in a researcher’s daily practice. Back at the office, these are being translated into potential product ideas. Developer Bas Kok said the experience let him see how researchers were collaborating using off-the-shelf productivity tools, and how his work at Elsevier could potentially impact their work. Robbertjan Kalff, VP of Product Strategy for Researcher Operating Systems, said the field trip reflected the ongoing effort Elsevier is making to ensure its platform development reflects researcher needs. Through its involvement in all stages of research, Elsevier is better able to help scholars and other professionals achieve their goals. The trip was part of a collaboration between Elsevier Labs and VU in the COMMIT Data2Semantics research project. Dr. Paul Groth (@pgroth) is Disruptive Technology Director at Elsevier Labs. He holds a PhD. in Computer Science from the University of Southampton (2007) and has done research at the University of Southern California and the VU University Amsterdam. His research focuses on dealing with large amounts of diverse contextualized knowledge with a particular focus on the web and science applications. This includes research in data provenance, data science, data integration and knowledge sharing. Paul was co-chair of the W3C Provenance Working Group that created a standard for provenance interchange. He is co-author of Provenance: an Introduction to PROV; The Semantic Web Primer, 3rd Edition (MIT Press) as well as numerous academic articles.